Home Unlabelled How Many Hours You Need to Sleep According to Your Age? 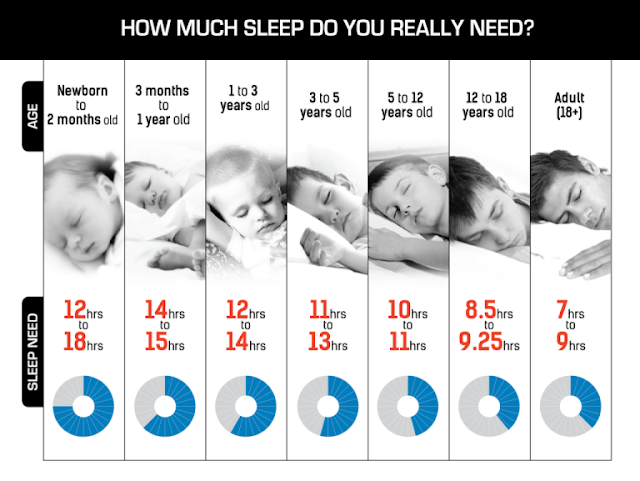 How Many Hours You Need to Sleep According to Your Age? We are getting old day by day. It feels like we were celebrating Christmas yesterday. Time flies fast and that really makes me down sometimes. Anyway, we need to live every day in full speed and achieve more in our lives. We can’t do that without getting some sleep. When I was “young and wild” I always thought of sleeping like it is lost time. Now, it’s not like that. Sleeping is crucial for every vital function of your body and mind. The amount and quality of sleep we get determine how well we will do through the day and how productive we’ll be. Quality sleep is crucial for every person. Especially for those who are dealing with chronic diseases and pain management issues. When it comes to sleeping, there is always this one question. Before I show you the infographic provided by the National Institute of Sleep, I need to tell you this. The amount of sleep an individual need is personal. Someone sleeps 4 hours a night and still manages to complete tasks through the day successfully. Not so long ago, I’ve read an article saying that successful people need only 6 hours of sleep to function 110%. I sleep 7 hours during weekdays and 7 hours and 30 minutes on weekends. I found this working for me and I hold on to that habit. Keep in mind that this is the total sleep you get during a 24-hour period. So, if you took a 30-minute nap, that counts, too! From what you’ve seen on the infographic, where do you stand? Did this show that you are а sleep deficient? I have a few symptoms that are most common in sleep deficient people. How to prepare yourself for a good night sleep? In some of my past posts, I discovered my habit before going to bed. My library is really huge and I can’t stop buying new books. A little knowledge before bedtime never harmed anybody. Make sure your friends get this. Share it with them through the sharing buttons below.